Macarons are the new madness, frenziness, fashion, trend or whatever else you want to call it in desserts. It is a meringue cookie and its main ingredients are egg whites, sugar and ground almonds. Macarons can be filled with buttercream, jam, lemon curd, pastry cream, whipped cream, chocolate ganache or any other filling you like. I tried making macarons a few months ago but the recipe I found online and tried, turned them out like meringues rather than macarons. The ingredients were the same but not enough explanations on how to make them. I am really excited and very, very happy to have won a copy of Jill’s cookbook “Mad About Macarons”. Macarons should not be confused with macaroons, which are also a meringue and almond based cookie or made of coconut. The modern macaron from Paris was introduced in the early 20th century. It is again a meringue cookie and its main ingredients are egg whites, sugar and ground almonds. “In order to distinguish a good macaron it must have a smooth surface, a little frilly foot or “pied” as it is called in French, a crispy outside and a soft, lighter filling. That’s the Parisian Macaron. If a cookie does not have the ruffled pied, it’s not a macaron”. Source: Mad About Macarons, by Jill Colona. I made my first batch last week and was really thrilled that they turned out great. I did not want to post a picture earlier because they do not look like Macarons should be but that is absolutely my fault. I did not have a plain nozzle, so I piped them using a star pointed one. 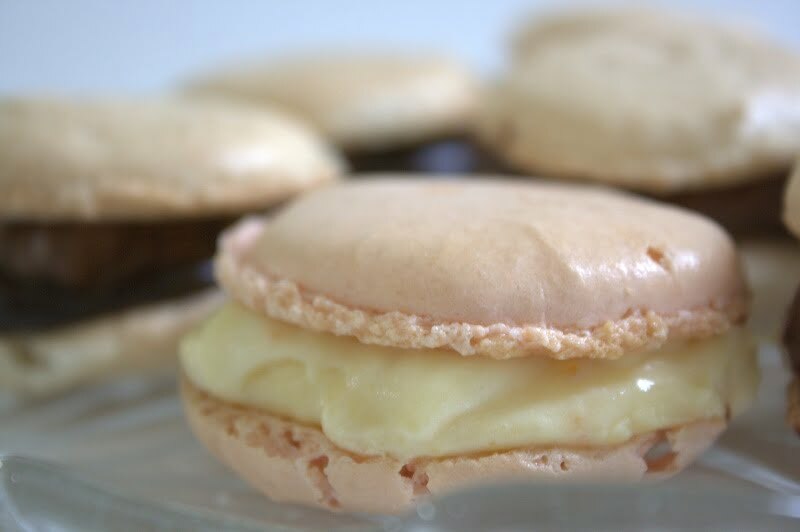 I also did not have a patisserie scraper to make the macaronage – the folding in of the dry ingredients to the egg whites, but still they were almost perfect, with a foot. I have now bought a plain nozzle but did not find the scraper so that’s why there are still some cracks on mine, but really I don’t mind because in any case they look good and taste amazing. I am sure that after a few more attempts they will soon come out perfect and once that is mastered, I know that the possibilities are endless. I am sorry that I cannot post the whole recipe, for obvious reasons, but I will give you the basic ingredients for the biscuit and I can tell you how I made the fillings, which are my creations. For the first batch, I made Jill’s basic recipe using cocoa powder. Unfortunately I did not have a brown colour to add so they are not dark enough but I did add some orange zest in the cookies, which gave them a wonderful taste. I then used the curd to make the buttercream. Macarons are similar to the Cypriot Dessert called “Pastitsia” page 146 of My Cookbook as well as in Volume 2 of my e-cookbook. So, the second time I made two kinds of macarons, each with 100 grams of egg whites. The first was with a plain cookie, filled with chocolate and citrus but I also wanted to recreate a Macaron with a 100% Greek flavour. I chose mastiha (mastic), which is the main flavour for Pastitsia, as the delicate and wonderful taste of “mastiha” is so addictive!! It only takes a few tear drops of mastiha to get this wonderful flavour. If you add too many, you’ll get a very strong flavour which will not be very pleasant. To fill the chocolate Macarons, I made a ganache with 125 grams bitter chocolate, 1 teaspoon butter and just enough heavy cream (about 3 – 4 tablespoon) until it reached the right consistency. I left the ganache to cool and added a layer of chocolate on the macaron. I whipped the leftover heavy cream I used in the ganache and made a chantilly, which I mixed with the leftover ganache. I added a layer of that cream on top of the chocolate and a slice of different citrus spoon sweet, like orange, bitter orange and bergamot. For the Mastiha Macarons, I added 2 drops of red colouring in the shell. I expected them to have a darker red colour but they turned out light pink. Allow me not to reveal the recipe for the mastiha macarons as a few things I want to keep to myself, in case I decide to make a business in the future, if and when we move to Assini. We were planning to move there last August but the economic crisis has made things very difficult for us. I would recommend this book both for experienced macaron makers but also for novice in baking, as well as people like myself who were terrified to make them. The directions are very detailed, the recipes are professionally written in a language that is easy to follow, and the book is beautifully designed with beautiful mouthwatering pictures. Macarons are gluten free by default but I alo noticed that there is a nut free macaron recipe for people who are allergic to nuts, so that is very considerate and useful. The fillings range from the classic to exotic flavours and colours. There is also a variety of savory macarons. I was really impressed at the end to see a Quick Reference Guide for Egg whites by weight, which if added up gives you a lot of combinations, depending on the egg whites you want to use. Another section which impressed me the most is that although this is a cookbook about macarons, Jill has sacrificed valuable space to give recipes with the leftover egg yolks. I have seen chefs using one part of the egg and throwing away the other, which makes me really frustrated to see food wasted just like that. What if some of the macarons are not perfectly shaped or break? My daughter wanted to pipe some of them out and she did not leave sufficient space between them. Some of them joined with the others and when taking them out some broke. Jill has some suggestions what to do with them but here is what I did. I used some of the leftover cream, some chantilly and spoon sweets (fruit preserve), et voilà! We don’t really celebrate Valentine’s Day, nor do I believe in this silly, commercial day, but it’s always nice to be reminded that there is someone who loves you unconditionally and who doesn’t need any expensive gifts as proof of that love. A simple gesture like offering something made with love is more than enough for me. Congrats! Your macarons look lovely. Wow! Ivy, what an honour to see you posting your macarons and thank you so much for your kind words about the book. Your filling of the orange curd looks delicious and as for the pastitsia Cypriot style macaron, this sounds incredible. I must try this recipe in your e-cookbook (I haven’t got that far yet, you have so many wonderful recipes to share in both volumes!) The mastihas sounds intriguing, too. What a wonderful post! Wow your macarons look so gorgeous. I have never been so brave to try making macarons. What a post, Ivy! Your macarons look wonderful and I bet they tasted even better :D. I haven’t tried them yet… but lately I cannot think about anything else but sweets and desserts. I hope you are ok, images on tv are tremendous and you must be having such a bad bad time. I hope all your future ideas and projects become true :D. Happy Valentine’s day! WOW! I am so impressed! These are the most creative and coolest macarons ever. I have heard horror stories about people attempting to make macarons and failing hard. You won this battle and more! Actually, I am going to get my man some vanilla bean macarons for Valentine’s day 😛 Good stuff! Ivy you are killing me… I would have never thought of using mastixa in this recipe. Very good! I am really nervous to tackle macarons, Ivy, but yours look fantastic. So impressive! Wow wonderful, I like macarons but never tried to prepare them because it seems too me quite difficult…yours are just great! I LOVE macarons, Ivy, and this one with mastiha must be amazing!! I love the taste of mastiha, what a wonderful flavor for the macaroons! they came out great!! I love the filling …yummy!! Wow I had heard of macaroons but never macarons before. They look quite delicious. I understand why you can’t post the recipe but thanks for telling us how to make the fillings. I think I will check out the book for sure as it looks like it will be quite useful. I have to try making macarons – one of my culinary everests yet to conquer! Yours look beautiful. I’ve made macarons once, and I need to attempt them again! The flavors you chose sound great. The orange curd buttercream must have been a delicious filling. I havent managed to make good macarons yet! These look great and delicious! I love macarons too.I do not eat them very often but are great and delicious! !